Felcsút is a village west of Budapest, where the national footballing academy was set up in 2007. Training centre initially provided 9 full-size fields, but 2 of them were sacrificed in 2012 to make way for the new main stadium. Now the arena is ready to serve a few purposes and is safe to have week-to-week football use. 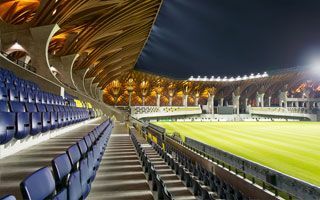 The stadium will serve as main venue for international games of Hungarian youth teams, while at the same time being home to top league Puskás Akadémia FC. This year it will also host the U19 UEFA Euro. Yesterday it played an even different role, as it hosted the final of Suzuki Cup, international youth tournament including, among other, Real Madrid, most notable club of Ferenc Puskas. The stadium already made headlines both in Hungary and internationally despite being located in a village and accommodating only 3,500 people. The fame is owed to aesthetics by Imre Makovecz, renowned Hungarian representative of organic architecture. Though Makovecz died before ending his last work in 2011, the project was finished along his guidelines by Tamás Dobros. Just like the Puskas Academy’s main building designed by Makovecz earlier, the new stadium has an interesting outer form. Both the shapes and materials used create a mix of traditional rural architecture with modern functions. The main grandstand (west side) has three domes dominating the smooth roof. Covered with black aluminum scales with shiny copper accents, the roof resembles more that of countryside sacral architecture, not uncommon among Makovecz’s other works. What should be considered the stadium’s main treat is hidden inside, though. Thick cast-on-site concrete pillars erupt with wooden beams that support the roof, also entirely covered with wood inside. The support structure resembles a forest with two rows of ‘trees’. Additionally, the front row of concrete pillars has a promenade incorporated into it, allowing fans to wander through ‘the woods’ during events. This kind of architectural forms is extremely rare for a stadium, but didn’t come at the expense of football infrastructure. Pancho Aréna, as the stadium was named (reflecting the nickname Puskas had in Spain), meets all major UEFA regulations and received Category II. Its field has under-soil heating, floodlights offer high quality despite no masts being used, while the main grandstand offers conference rooms, restaurant and a special room with memorabilia devoted to the legendary Ferenc Puskas. If any disadvantage, the stadium earned some criticism over its cost. With budget set at HUF 3.8 billion (€12.4 million / $17 million), the stadium is more expensive than average. Cost per seat is almost double that of nearby Albert Flórián Stadion, also being delivered currently.